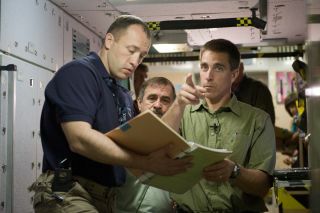 Russian cosmonaut Alexander Misurkin (left) and NASA astronaut Chris Cassidy (right), both Expedition 35/36 flight engineers; along with Russian cosmonaut Pavel Vinogradov, Expedition 35 flight engineer and Expedition 36 commander, participate in an emergency scenario training session in an International Space Station mock-up/trainer in the Space Vehicle Mock-up Facility at NASA's Johnson Space Center. An American astronaut and two Russian cosmonauts are preparing to join the crew of the International Space Station in March, but before they blast off, they'll have to face the thing all students dread: final exams. NASA astronaut Chris Cassidy, along with Alexander Misurkin and Pavel Vinogradov of Russia, are due to launch toward the space station aboard a Russian Soyuz spacecraft on March 28. They will lift off from the Baikonur Cosmodrome in Kazakhstan and join the station's Expedition 35 crew a few days later. The spaceflyers plan to spend about six months in space performing experiments and keeping the $100 billion space laboratory in tip-top shape. But for now, the crew is spending its final weeks before launch cramming for a critical two-day exam that will take place in the Russian town of Star City. The test is one all space station crews must pass before they are cleared to launch. "We're honing in on the end of a two-and-a-half-year process, which is culminating with some intense training here in Houston," Cassidy said in a NASA briefing today (Jan. 17). "We'll soon be in Star City where we'll have our final exams." On the second day, they'll tackle the same challenges inside a Soyuz simulator, carrying out mock launch, rendezvous and undocking sequences while clad in their Russian Sokol spacesuits. All this will be observed by a Russian state commission that includes veteran cosmonauts and officials. "It sounds scary and it is intimidating the first time you do it," Cassidy told SPACE.com. "When you're sitting in a big gigantic room with a lot of experienced Soyuz commanders, and they're asking questions about why you put your hand in a certain place, it can be intimidating. But in my opinion it is a good process. It can really make you step up your game." Crews must pass the exams before they are allowed to launch to space, but if at first they don't succeed, they do get a second chance to try again. "Recently there have been some crews that have made a critical mistake," Cassidy said. "And what they’ll do is make you redo that section and just fine-tune it." Cassidy, Vinogradov and Misurkin will be taking their test March 6 and 7. The first two spaceflyers have some experience under their belt, as both have flown to space before: Cassidy flew on NASA's STS-127 mission of the space shuttle Endeavour in 2009, while Vinogradov is a veteran of two previous spaceflights, including a trip to Russia's space station Mir in 1997 and the International Space Station's Expedition 13 mission in 2004. "We're approaching the finishing line," Vinogradov said today at the NASA briefing. "We only have a few weeks left of training, including the training in Moscow. We have an excellent team." Misurkin, meanwhile, is a rookie spaceflyer who joined the cosmonaut ranks in 2006. This upcoming space mission will be his first. "I'm just really excited and looking forward to this flight," Misurkin said. "I think it [will] be a great experience for me and the biggest thing in my whole life."